Our Why Your Office Should Consider a Membership Club Infographic and the included dental training resources will provide your team with important insight into the “Why” behind dental membership and aid in the creation and growth of a successful membership club for your dental practice. The most frustrating phone call dental offices receive is the patient who calls to tell the office they no longer have dental insurance and they need to cancel their cleaning appointment. It is trying because it results in an opening in our schedule but is also frustrating because the patients feel they can’t come in without insurance – Having the option to offer a Membership Club to these patients could be the key that keeps them feeling in control of their dental health and ultimately, as your patient! 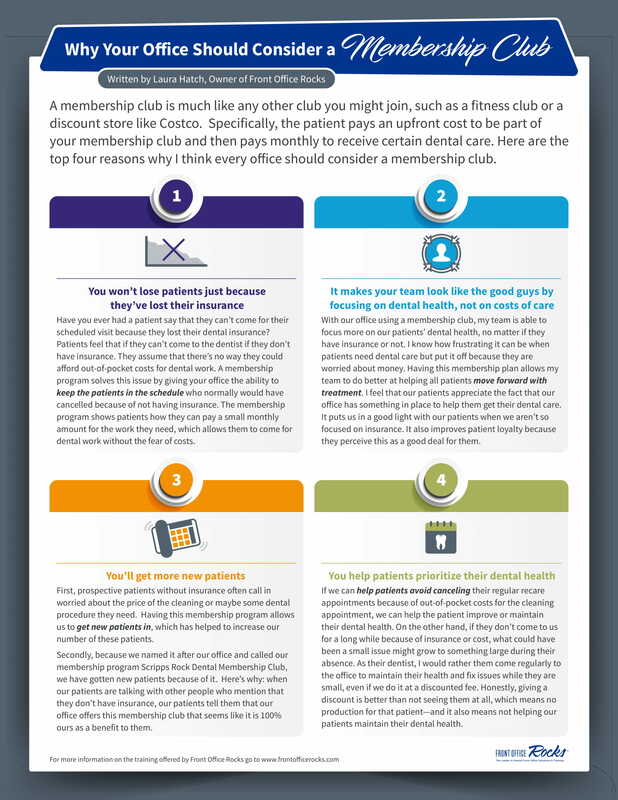 Learn more about why your dental practice should consider a membership club below! A Membership Club is much like any other club you might join, such as a fitness club or a discount store like Costco. Specifically, the patient pays an upfront cost to be part of your dental practice’s Membership Club and they will then pay monthly to receive certain dental care. Visit our article, Why Your Office Should Consider a Membership Club, to find out more! You won’t lose patients just because they’ve lost their insurance. It makes your team look like the good guys by focusing on dental health, not cost of care. You’ll get MORE new patients. You’ll help patients prioritize their dental health. As their dentist, I would rather them come regularly to the office to maintain their health and address issues while they are small, even if we do it at a discounted fee. The truth is giving a discount is better than not seeing them at all, which means no production for that patient while they are away and it also means not helping our patients maintain their dental health. If you and your team are tired of having patients cancel because they lost their insurance, I highly recommend that you consider a membership club for your office! Before setting up a dental membership club, please be sure to check your state laws regarding your ability to offer and advertise a program like this in your state.